The Sitka Fanatic Bibs are built for deer hunters. They trap in body heat and have berber cloth so they’re quiet. I’ve done a lot of hunting and spent a lot of time outside throughout my life and I’ve come to realize a few things, the most important being that if you’re wet and cold, you’re not going to have a good time. Having tried hundreds of products looking for the best gear that isn’t bulky, isn’t too heavy and keeps me warm and dry, I’m really lucky to have found Sitka and their whitetail gear. The Sitka Fanatic bibs are easily the best bibs for whitetail hunting that I have ever tried and the deer will never see you in a tree. 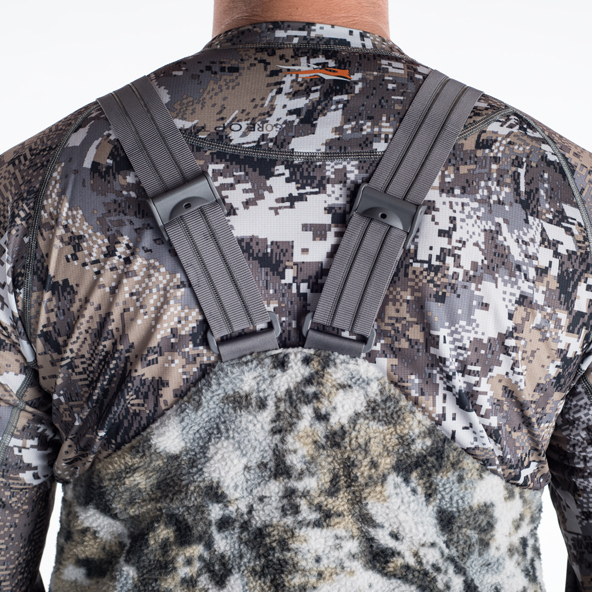 Sitka Gear’s Fanatic bibs offer a fantastic camo pattern built for tree stand hunters. Not only is the Sitka Fanatic Bib built to withstand all types of cold and wet weather, but they’re made specifically for deer hunters. Bow hunters need gear to sit on stand all day that won’t get in the way when it comes to shooting time and these Fanatic bibs fit the bill. The 2015 Sitka Fanatic bibs are quiet, warm and have a GORE WINDSTOPPER barrier to keep the wind off of your skin. 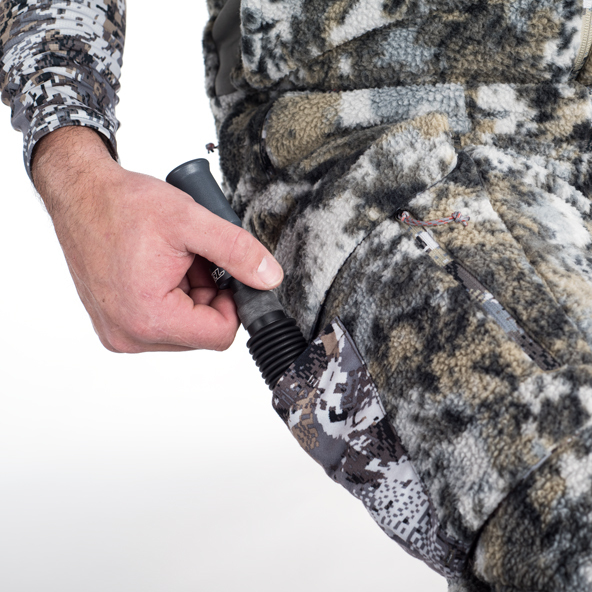 A grunt tube fits nicely in the pocket designed for it on the Sitka Fanatic Bib. 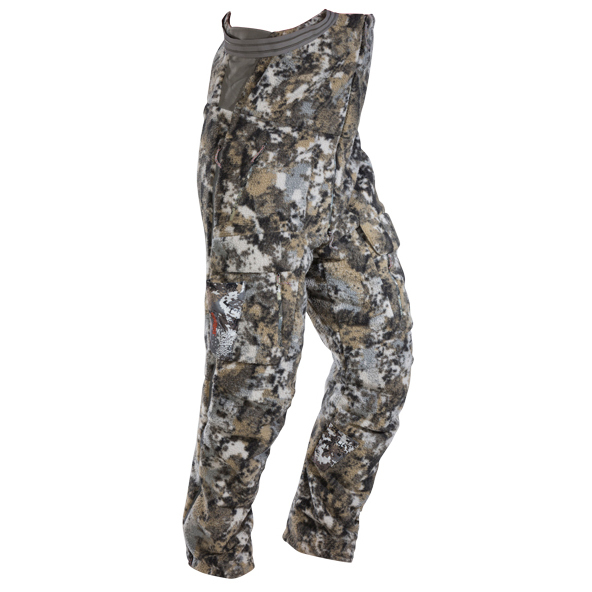 Primaloft Silver Insulation traps your body heat in to keep your legs warm and your rubber boots will fit comfortably over the low bulk hems on the bottom of the pants. Sitka builds gear with more insulation and fabric where you need it and less where you don’t. The knees bend easily without breaking the bibs in and the bottom of the pants have less insulation over your boots where it’s not as necessary. The back of the Fanatic bibs are very comfortable, easy to put on and stay in place. One of the coolest features of the pants is that there is a dedicated ankle pocket on the bibs that allows you to rest a traditional bow on your leg hands free. You can also keep your hands warm in the lined pockets, that is of course if you’re not wearing the Sitka Fanatic jacket with the built in hand muff. 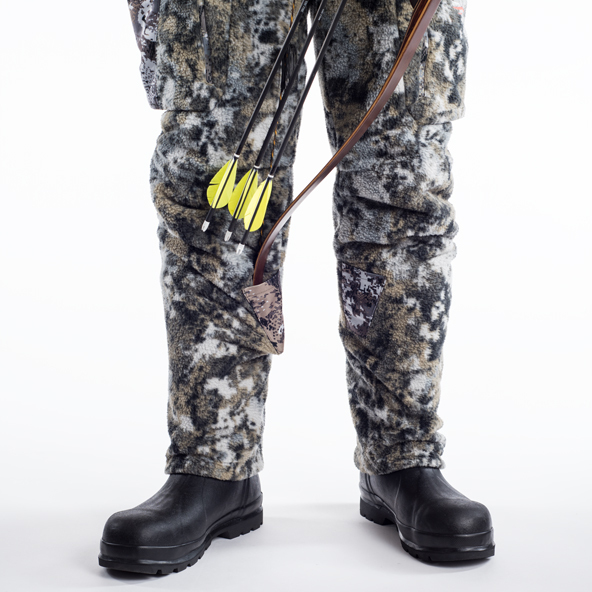 Overall, the Sitka Fanatic bibs are a great fit, literally, for bow hunters. They are comfortable, warm and not bulky so that you can easily move around when the moment counts. You can purchase your own Sitka Fanatic bibs on their website for $389 and they’re worth every penny. Don’t miss more Sitka gear reviews on MorningMoss.com.